Wooden stained shutters are a great addition to any room in the house, much like white shutters they are suitable for a wide range of designs. 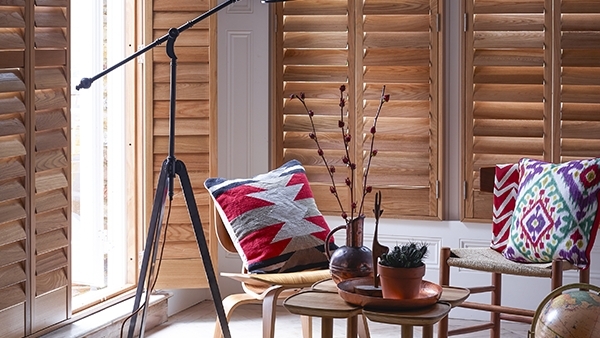 The most commonly sold colour for plantation shutters is white or shades of off white. People tend to pick this colour as even if you redecorate a room, white will match your windows and therefore go with your new design. Stained wood is also versatile in the sense that it can work as a neutral shade, but also a highly unique design for all manner of rooms. Lighter stained woods are more adept to shutters that may want to sit neutrally in a room. Going for one of our sunnier shades, Natural or Light Oak, can give your room an airy look that will easily match most furniture or paint styles if redecorated. These colours are selected more in the spring when people are searching for light colours for their room designs, typically found in bedrooms and bathrooms. Darker stains can be used to create a dramatic and strong feel to any room. A great use is for reading rooms or studies, areas you may want to keep in the traditional English look of leather bound books and Walnut stained woods. We would recommend using elm for dark stains to give that true luxurious deep grained look.Whatever style you pick, wood would work!